Technological Taxidermy is a local nonprofit teaching artists the ins and outs of synthesizers and electronic music production. The process of learning modular synthesis is not unlike learning a language. The act of using components to build and hone a simple sound wave, with its multitude of timbres and modulating effects, is almost like an infant learning an inflection, or even simply making sounds close to the words. “We are learning to speak a language that is happening all over the world,” says electronic musician Tobias Hendrickson. 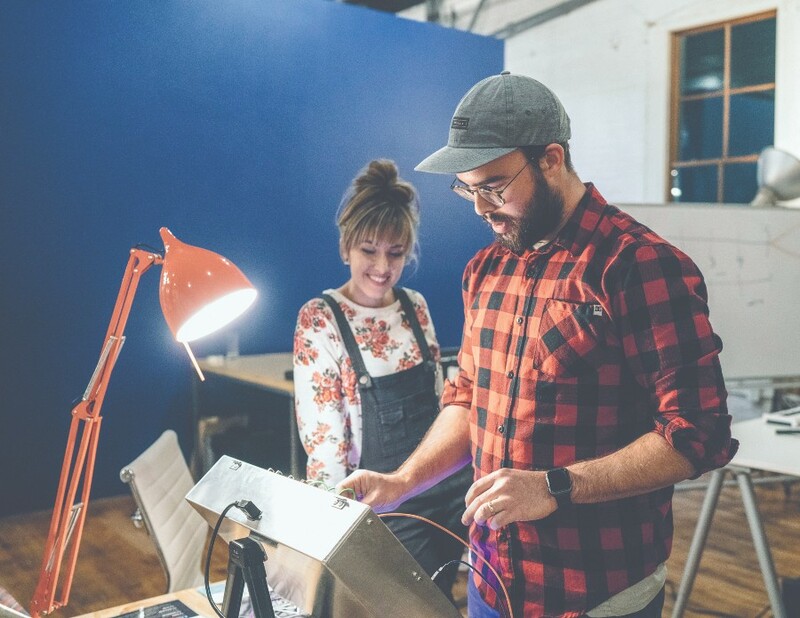 Tobias and his wife Chelsea are founders of Spokane’s Technological Taxidermy (TT), a nonprofit educational program and community trying to build a synthesizer scene in Spokane. On July 7, the couple and other members of the program will be showcasing their work and their designed systems at the Bartlett. To the uninitiated, electronic music can quickly conjure up the idea of fad EDM cycles, with blasting digitized synths pre-bottled on a laptop only to be unleashed by pressing play on a turntable. But the multitudes available in analog and physical synthesizers turn that idea on its head, with limitless possibilities and rhythms that make no two artists the same. The group meets once a month, either at Terrain’s space, the Bartlett or Fellow Coworking, with workshops and lessons on how to progress artists’ ideas, or simply history lessons on a vital tool or person in electronic music. They also give time for exploration, when members are encouraged to dabble and discover with the gear available to them alongside other members of the class. Eventually, when the artists are comfortable, there’s an opportunity to showcase outside of the class what they’ve learned and thought up. The Hendricksons were thrilled when, midway through their first run of classes, other members of the community began teaching workshops and programs, something they wished would happen through the second run. Because it is such a new kind of instrument and genre that blossomed mostly online, the couple weren’t sure what the early response to their efforts would be. Tobias thought hopefully he would see four or five heads at the first meeting, and then work on keeping them coming and telling their friends to join in. But from the start, TT has seen a dozen to 20 members at any given class, and that excitement is only growing. The peer group features an array of skill levels, ages and backgrounds, with the program’s focus being on inclusivity and diversity. One night, when Chelsea saw that she was the only woman, she became dedicated to getting more women to the next event, believing that more stories need to be present in such a hyper-personal genre. “Someone who has been doing modular their whole life and someone who just started can have an equally enjoyable experience sitting down at a system,” Tobias says. The nonprofit is under the Terrain umbrella of artistic nonprofits, and the Hendricksons credit that network — along with their relationship with the Bartlett and the general synth community throughout the world — for the major strides TT has seen in its first year of operation. Both Tobias and Chelsea performed and spoke at the 10-year celebration of synth company Make Noise in Asheville, North Carolina. They were part of a panel focusing on community outreach, along with community leaders from cities like Portland and Chicago. During the panel, someone chimed in about Spokane: “Isn’t that the racist part of Washington?” The comment left both Chelsea and Tobias a bit aghast, though their answer was in part explaining how creating and inspiring a diverse music community could help impact regressive societal norms. After the panel, Chelsea recalled someone from the North Carolina area coming up to her and appreciating her answer to the uncomfortable comment. “They were really appreciative that even if there are these barriers that there isn’t an excuse to not try and make the community better and make an impact on it,” she says. Tobias’ commitment to community outreach brought on a new and unexpected full-time job. While corresponding and trying to get local schools to maybe do a field trip or attend one of TT’s events, PRIDE Prep Charter Schools instead proposed hiring him as the school’s first music instructor. “It’s great because they actually want me to continue focusing on TT to show their students that they are learning something that can be implemented outside of the classroom,” Tobias says. The original print version of this article was headlined "Electronic Education"